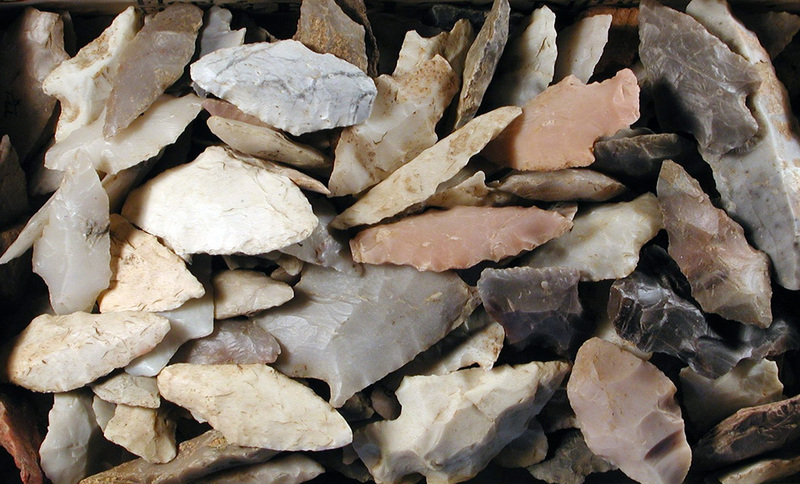 Novaculite was the preferred raw material for chipped stone tools made by Indians living in Arkansas’s Ouachita Mountains and Gulf Coastal Plain. One of the significant natural resources in Arkansas is novaculite, a siliceous rock that outcrops on ridges in the Ouachita Mountains around Hot Springs. Now used for whetstones, novaculite was quarried by Indians in the past, who used it as raw material for a variety of chipped stone tools. These ancient novaculite quarries, some with pits and trenches extending for two to three miles along mountain ridges, are some of the largest archeological sites known in Arkansas. 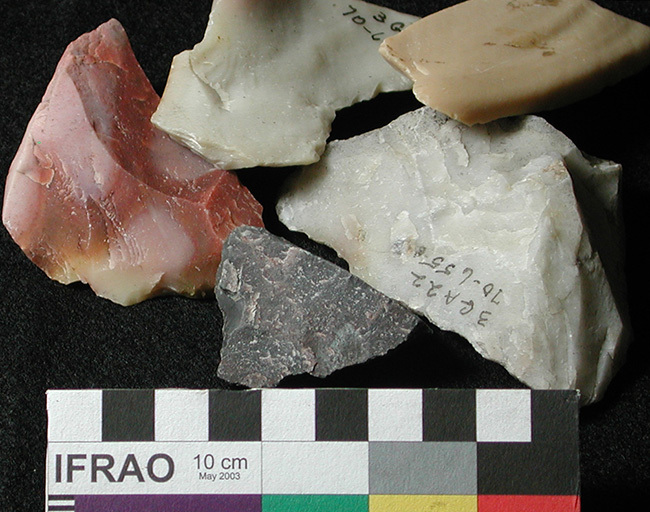 Arkansas novaculite occurs naturally in a range of colors and textures. Two novaculite quarries with extensive evidence of aboriginal quarrying (3GA22 and 3GA48) were given national attention by William Henry Holmes (Bureau of American Ethnology), who visited them as he prepared the Smithsonian Institution’s Anthropology exhibits for the 1893 Chicago World’s Fair. In an 1892 article published in Science he wrote: “The extent of this work is in several cases so vast as to fill the beholder with astonishment. In one place in Arkansas it is estimated that upwards of 100,000 cubic yards of stone have been removed and worked over,” (Science vol. 29, no. 512, p. 295). 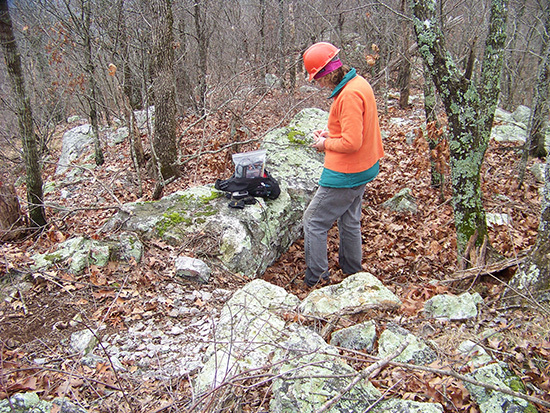 The Arkansas Archeological Survey has undertaken several projects to research Native American quarrying, tool production, and exchange of novaculite. Some of these have been collaborative projects with Hot Springs National Park and the Ouachita National Forest. A 1996 cost-share agreement with the Ouachita National Forest included a workshop with quarries experts from across the country, and led to a detailed novaculite quarries research design with suggested research projects (Trubitt, Green, and Early 2004 in The Arkansas Archeologist, vol. 43). In 2013, the Arkansas Archeological Survey launched a new website, “Arkansas Novaculite: A Virtual Comparative Collection,” funded in part by a grant from the Arkansas Humanities Council and the National Endowment for the Humanities. The website includes descriptions and images of quarry sites and novaculite samples from Garland, Hot Spring, Montgomery, and Polk counties. An interactive map on the website, connected to a database of novaculite quarries and archeological sites where novaculite artifacts have been found, shows the novaculite sources and its distribution in and beyond Arkansas. This database is updated with information submitted from archeologists and others interested in stone tools and Arkansas’s history. 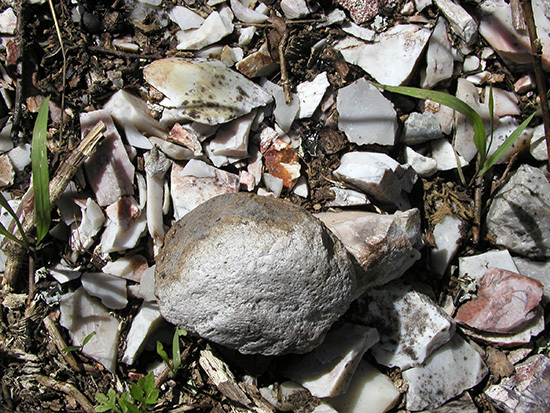 A hammerstone and novaculite debris left on the surface of this Polk County site are evidence of past quarrying activity. Trubitt documents a quarried trench feature during a visit to a novaculite quarry site in the Ouachita National Forest in 2013.